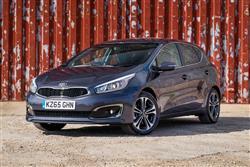 Kia's second generation cee'd has been revitalised - apparently. Jonathan Crouch checks it out. The second generation Kia's cee'd now has more to offer in the Focus and Astra-dominated family hatchback class, thanks to a wider range of engines, higher specifications and a smarter look, both inside and out. As before, there's a choice of five-door hatch, Sportswagon estate and pro_cee'd coupe bodystyles and all benefit from greater efficiency and better refinement. The rise and rise of the Korean motor industry has been one of the enduring industrial stories of the last decade, right up there with Google, Apple and Facebook and every bit as impressive. From an embarrassing budget brand base, marques like Kia are now embarrassing mainstream makers with style and high technology at sensible prices. It was an evolution that took less than ten years and one that all began with one car - the cee'd family hatchback, launched in 2007, with a more sophisticated second generation version announced in 2012, but which time the brand was also offering the car in estate and coupe guises. With the MK2 model, Kia took the brave step of announcing pricing that wasn't far off the kind of money being asked for mainstream rivals, a strategy that initially worked quite well as buyers appreciated the better build quality and high equipment levels on offer. In recent times though, key competitors have upped their games, hence the need for this heavily revised version with its smarter look and its option of a frugal 1.0-litre T-GDI powerplant. Can the changes made keep the cee'd success story going? Let's find out. Under the bonnet, the key news here is the introduction of Kia's latest 1.0-litre T-GDI turbo petrol direct injection engine, offered in 98bhp and 118bhp outputs. We can't really see much point in opting for the pokier version as its pulling power - 171Nm of torque - is no better than that of the base unit. Either way, if you want a petrol engine in your cee'd, this powerplant offers a far more satisfying choice than the old 98bhp 1.4-litre petrol unit that's still offered on lower-order variants of this second generation model. There's also a 201bhp 1.6-litre T-GDI turbo GT petrol model at the top of the range. Most cee'd buyers though, want a diesel. There's an old-tech 89bhp 1.4-litre CRDi variant still available, but most buyers will want the more efficient, higher-tech 1.6-litre CRDi unit, offered with 134bhp. This powerplant gives buyers the option of a 7-speed dual-clutch DCT automatic transmission, one of those clever gearboxes able to seamlessly select the next gear before you've even left the last one. For this diesel variant, improvements in refinement have been prioritised, so additional sound-absorbing materials have been adopted for the carpet and ventilation system, while twice as much anti-vibration foam has been added to the dashboard panel to cut engine vibrations intruding on the calm of the cabin. Otherwise, things are much as before. So the driving dynamics still won't satisfy those for who see handling response as everything, despite the addition of a torque vectoring system, which reduces understeer by partially applying the brake to the inner wheel under cornering. You still get a supple multi-link rear suspension system, something that's still not the norm in this segment. And there's neat FlexSteer steering that allows you to alter feedback at the helm. Plus these models are as rapid as most owners will need them to be, the 134bhp diesel 1.6 making sixty two mph from rest in 9.5s on the way to 117mph. This cee'd might not be quite the bargain it once was but it still represents an awful lot of quality for your money. Asking prices sit in the usual £17,000 to £23,000 bracket common to mainstream family hatchbacks these days, but within this, Kia still reckons to undercut obvious rivals by around 15%, a claim largely borne out by list price study. Whichever petrol or diesel cee'd you choose - five-door Hatch, Sportswagon estate or pro_cee'd coupe - you should find it to be decently equipped, despite the tight pricing. Even the entry level model gets air conditioning with a cooled glovebox to keep your drinks chilled, a decent quality CD stereo with steering wheel controls, plus USB and iPod connectivity, electrically adjustable heated door mirrors, a height-adjustable driver's seat, front electric windows, daytime running lights and Hill Start Assist control to stop you from drifting backwards on uphill junctions. Plus all the usual safety stuff. Naturally Kia will sell you ritzier versions, complete with features alloy wheels, cruise control, parking sensors and the Flex Steer system that'll adjust steering weight to suit the conditions you're in. Of course, the really high-tech stuff sits further up the range and on the options list where you'll find everything rival brands offer and more with features like a huge panoramic glass roof, a 10-way power-adjustable driver's seat with memory, a Parallel Parking Assist System that'll automatically steer you into tight spaces and a Xenon adaptive front lighting system with automatic levelling. You can see why Kia needed to develop this improved cee'd model's 1.0 T-GDI petrol engine. After all, the returns of the older 1.4 and 1.6-litre petrol units it effectively replaces were hardly very noteworthy, even when fitted with the brand's Idle Stop/Go package. In contrast, the more modern 1.0-litre turbo unit can deliver 57.6mpg on the combined cycle, whichever tune you order it in. The CO2 return is 113g/km for the 98bhp version and 115g/km for the 118bhp model. Choose the 134bhp 1.6 CRDi diesel and you should manage 78.5mpg and 94g/km. As for the twin-clutch DCT automatic gearbox optionally offered to 1.6-litre diesel cee'd buyers, well Volkswagen has already proved that if this technology is done right, the result can actually be an improvement of fuel and CO2 figures over the equivalent manual models. That's not the case here though, where they take a dip of over 10%. That means 67.3mpg on the combined cycle and 109g/km. There will still be people of course, who'll blindly buy a Focus, a Golf or some other family hatchback from a conventional mainstream brand without considering its Korean alternative. But these will largely be uninformed folk yet to fully cotton on to the way that products in this segment have changed. Thanks to the success of this cee'd, there are fewer and fewer customers of this kind around. Of course, shortlist selection isn't the same as a sale. There are family hatch folk who'll want more powerful engines or more dynamic handling than this car can offer. But, we'd suggest, many more will enjoy this improved Kia's sharp looks, impressive quality, class-leading practicality and low running costs. True, the asking prices may be a little higher than you might expect from a South Korean brand, but don't judge them until you've tried the product, a confident design from a very confident brand. We think you might like it.